Edelbrock 2902 Victor Jr Intake Manifold w/Bolts/Gaskets/RTV BBC Rectangle Port. 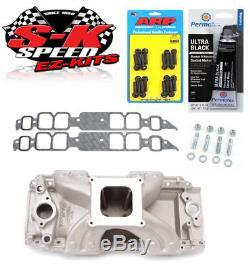 This listing is for an Intake&###xA0;Kit for the Big Block Chevy with Rectangle&###xA0;Port Heads. Gasket Carburetor Stud Kit (Part # 59)&##xA0. This intake works with square bore carburetors. We've put together a proven&###xA0;kit to take the guesswork out of choosing the right components for your performance&###xA0;BBC Engine! Designed for competition 396-502 big-block Chevys. #2902 fits rectangular-port heads and #72902 features out-of-the-box pre-assembled direct port nitrous system ready to bolt on and go! &###xA0;#2904 fits large oval-port heads (1975 & earlier). These intakes are designed to optimize the flow characteristics of an 850 cfm standard flange carb. Features include extended runner dividers, smaller plenum chambers and unique runner design for better 60 foot times and max power from 3500 to 7500 rpm. These manifolds are especially suited to 502 c.
#29020 is a single plane 4150 flange competition&##xA0. &###xA0;designed to fit standard deck blocks from 1965 to present. This manifold is cast with 3/8" more material in the corners of the ports for a final radius of 3/4". This extra material allows for custom port matching for use with various cylinder head applications. It is designed to be matched with our Edelbrock/Musi Victor 24&###xB0; Pro-Port CNC heads #61419 or #61409 for 950+ hp out-of-the-box potential! 454-R #2902 will fit Edelbrock Victor race heads #77609 and Victor 24&###xB0; #77409, #77459, #77429, #77479 and #77489. ARP Black Oxide Intake Manifold Bolt Set. ARP's rugged, black-oxide coated chromoly intake manifold bolts are rated at 170,000 psi. They're precision-machined for optimum thread engagement and have a wide-area flange for better load distribution. They also feature precision-rolled threads, which prevent galling, while promoting more consistent torque loading. Starting from a small garage in the 50's to the beautiful new 6000sq ft showroom we have today, customer service has always been a top priority. We can only process Domestic credit cards. Which carrier is used depends on your location. We will choose the carrier that will deliver the quickest for your location. We can not and will not declare an item as a gift. We strive for accuracy, however, there could be discrepancies on the manufacturers end with listing applications. PLEASE MESSAGE US WITH ANY QUESTIONS OR CONCERNS ABOUT YEAR/MAKE/MODEL INFO IF YOU NEED! That said, we will assist in processing a claim. In either case, we will assist in the process. This listing is currently undergoing maintenance, we apologise for any inconvenience caused. The item "Edelbrock 2902 Victor Jr Intake Manifold withBolts/Gaskets/RTV BBC Rectangle Port" is in sale since Wednesday, May 17, 2017. This item is in the category "eBay Motors\Parts & Accessories\Car & Truck Parts\Air Intake & Fuel Delivery\Intake Manifold". The seller is "espeedshop" and is located in Lindenhurst, New York. This item can be shipped worldwide.